No matter if it’s your child’s first step, first day of school, or first night tucked away in a new dorm room away from home, there comes a moment when you realize just how quickly the years are flying by. 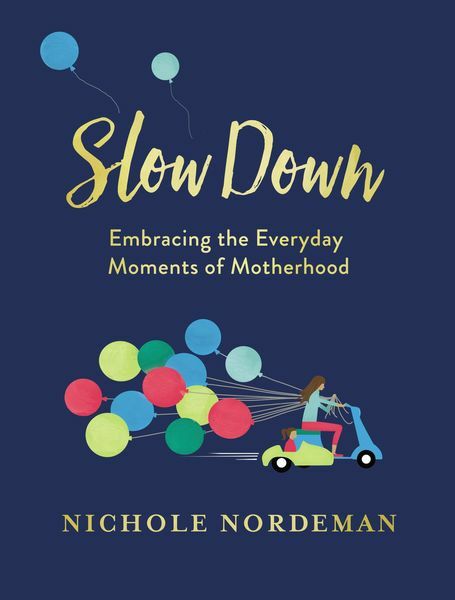 Christian music artist Nichole Nordeman’s profound lyrics in her viral hit “Slow Down” struck a chord with moms everywhere, and now this beautiful four-color book will inspire you to celebrate the everyday moments of motherhood. Take a few moments to reflect and celebrate the privilege of being a parent and getting to watch your little ones grow—and Slow Down. Nichole Nordeman has sold more than 1 million albums as a Christian music artist and has won 9 GMA Dove Awards, including two awards for Female Vocalist of the Year and Songwriter of the Year. Nichole released a lyric video for her song “Slow Down,” and it struck a chord with parents everywhere, amassing 14 million views in its first five days. She lives in Oklahoma with her two children.